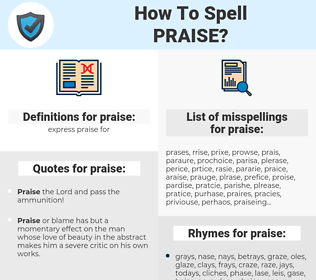 What are the misspellings for praise? What are the common mistypes for praise? 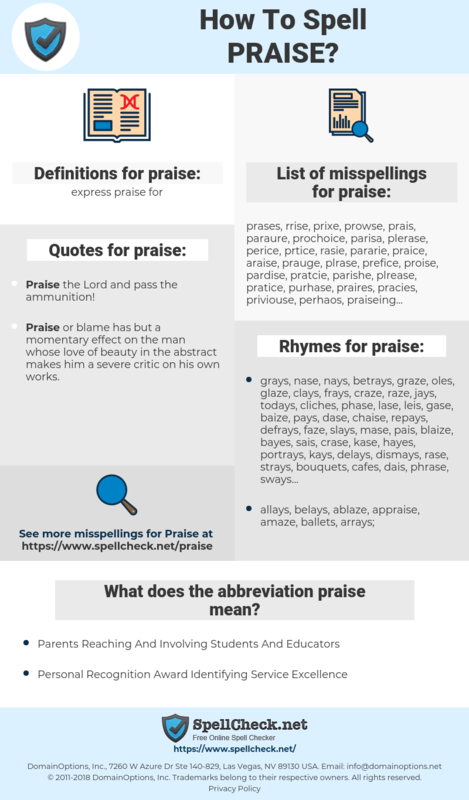 What does the abbreviation praise mean? What are the quotes for praise? What are the rhymes for praise? What are the translations for praise? What are the common typos for praise? Praise as a girl's name. This graph shows how "praise" have occurred between 1800 and 2008 in a corpus of English books. For if there is anything to one's praise, it is foolish vanity to be gratified at it, and if it is abuse- why one is always sure to hear of it from one damned good -natured friend or another! lofzang, loven, roemen, pluim, prijzen, vereren, lofprijzing, verheerlijken, ophemelen. honorer, saluer, louer, complimenter, glorifier, éloge, louange, adoration, faire l'éloge de, encenser, porter aux nues, faire l’éloge. Anerkennung, Lob, Auszeichnung, Preis, Anbetung, loben, rühmen, anpreisen, Rose, Lobpreis, Belobigung, preisen, lobpreisen, belobigen. さんび, 褒める, 讃美, 礼讃, しょうする, 賞める, 賛嘆, 賞讃, 褒め称す, ほめまつる, 言い囃す, 賞讚, 褒め奉る, 褒め称える, たんしょう, 賛, かしょう, 称揚, 讃, ほめ立てる, 歎賞, 讃賞, らいさん, ほめそやす, さんたん, 嘆称, ほうじ, 褒め立てる, 誉め称える, 讃嘆, すいしょう, 佳賞, 誉めそやす, 歎称, 讃歎, ほめたてる. saudar, louvor, glória, homenagem, louvação, exaltação, encómio, glorificação, louvar. хвалить, высоко оценивать, похвала, воздать должное, восхвалять, превозносить, хвала. elogio, alabanza, elogiar, felicitar, alabar, aclamar, reconocimiento, halagar, halago, encomio, exaltación, aplauso, adulación, loa, encomiar, ensalzar, exaltar, adular, loar, glorificar, enaltecer.